I've seen these before but usually imprints from a Barred Owl. This imprint was too small for a barred owl. I measured the wingspan and it was 15 inches. The closest owl wingspan to that is the Northern Saw-whet which Sibley lists as having a 17 inch wing span. We just released a rehabilitated saw whet owl here less than a month ago. Could this be from the same bird? Saw-whets are known to live in the area but we almost never see them as they hide so well. I'm assuming the bird that made this was was after a vole. We usually see red-backed voles under the feeders picking up the scraps. 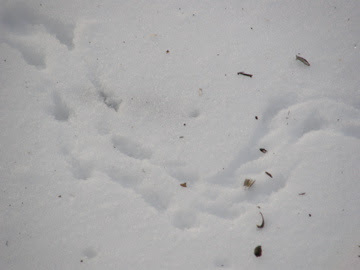 There were vole tracks all over out there. I'll have to keep my eyes open for saw whet owls staking out the feeders this winter.